The November 2015 Meeting of NV-CURE will be held on 11/18/15. There will NOT be a NV-CURE Meeting in December of 2015. The January 2016 Meeting of NV-CURE will be held on 1/27/16. a. Discussion, Nomination of Adam Tingley, Legislative Coordinator and Vote (John). b. Discussion, Nomination of Deanna Franck, Prison Communications Specialist and vote (John). CARSON CITY, Nev. (MyNews4.com & KRNV) — The director of the Nevada Department of Corrections has resigned, according to the governor’s office. Gov. Brian Sandoval accepted the resignation of Director James “Greg” Cox on Monday, his office said in a statement. The cause for his resignation was not immediately known. Cox was appointed as director in June 2011, according to the department’s website. He began his career in Nevada in 2003 as warden of the Southern Desert Correctional Center in 2003. E.K. McDaniel was appointed as interim-director, effective immediately, according to the statement. McDaniel has been with the department of corrections since he started his career in Nevada as warden of the Ely State Prison in 1993. He was recently promoted in 2011 to deputy director of operations, the statement said. “As we move forward, E.K. will help provide a smooth transition while we work to find new leadership for the Department,” Sandoval said in the statement. “…State Sen. Tick Segerblom, D-Las Vegas, defended Cox on Twitter following news of his departure. “This is so sad. Cox was a real reformer stuck in an underfunded institution which refused to reform,” he wrote. Deputy Director of Operations E.K. McDaniel will serve as the interim director, according to a news release from Sandoval’s office. McDaniel began working as a correctional officer in Oklahoma in 1975 and eventually became the deputy warden of the Oklahoma State Penitentiary before joining NDOC as the warden of Ely State Prison in 1993, according to Sandoval’s office. We are definitely worse off with E.K. McDaniel, and we are glad he is only an interim. Therefore let us hope that a real strong reformer will be appointed who can stand up to EK and his old-boy network likes, who have been the cause of so much pain and suffering inside, so much torture. 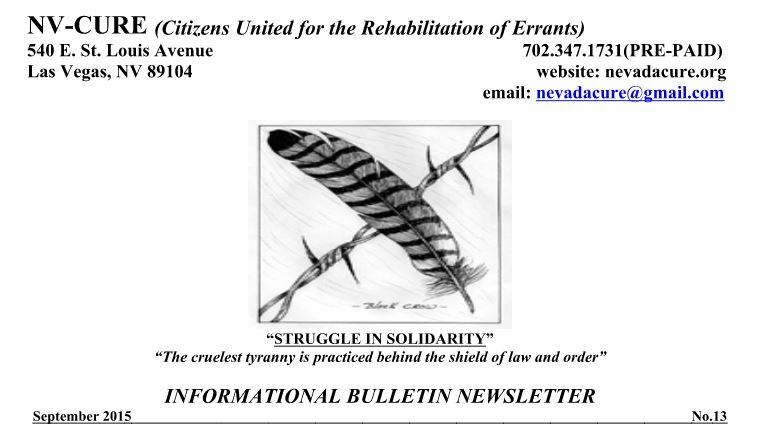 Times are changing, with more and more awareness about the many human rights abuses and over-incarceration in prisons around the country, and Nevada has to change too, for the better this time. Director Cox resigns; E.K. McDaniel appointed interim director. McDaniel is the former warden of Ely State Prison. He is responsible for the death of Patrick Cavanaugh by gangrene because Cavanaugh’s diabetic medication was withheld. McDaniel went to court and made himself conservator over Cavanaugh without the consent of Cavanaugh’s family. McDaniel stood on the tier of Unit 3B at ESP and laughed after Timothy Redman allegedly hung himself after guards emptied seven or eight big cans of pepper spray directly into his cell. In the opinion of NV-CURE, this shows that McDaniel will lie to the legislature, that he can’t be trusted with the well-being of prisoners or our tax dollars, and that he must not be appointed to a permanent position as Director. This is a huge setback to all the hard work NV-CURE has done. Please join NV-CURE and help us STOP McDaniel from receiving a permanent appointment as Director of NDOC.